…I’d shared some thoughts on trading volatility and the action of the S&P 500. I was right about the down-move in the S&P 500. I thought a small move was possible of no more than 5% and a 3% percent move down is what we got, then a continuance of the sideways consolidation. However, I was very wrong about volatility. I suspect the reason is because the trade was simply too crowded. Volatility became a trade du jour as the intense bounce that had started in February had obviously grown long in the tooth. But crowded trades are a trading fool’s errand and my thesis was wrong. And so ended one of the greatest 6-month runs I’ve ever had in reading the tape, but now I’ll just have to start fresh on a new run of prognostications. The crowded trade of long volatility and short the S&P 500 was skewered by the “market making” bot shops. Even Mr. Bonds himself, Gundlach, came out and stated during a Reuters interview that from the 20th of May and on the action in the stock markets felt like a short squeeze. JPM backed that assessment as one of the largest broker dealers out there. 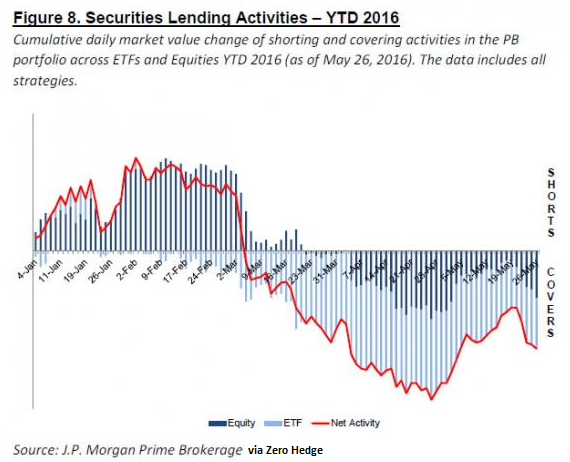 Observe a chart they released verifying the quick spike at the end of May in short covering. As this short-covering burst has squeezed a chunk of the volatility hedging, too, we still very well may get a correction of 5%ish down to just below 2,000 on the S&P 500. Volatility is still worth watching for a quick scalp if enough weak hands have been washed out and the robots let some negative momentum push the S&P 500 down and volatility up. Just look at the last week, specifically. Talk about momentum ignition. The Commercial Hedgers have gone supremely short but this softy keeps ripping higher, moving 16% in the last week. Crazy. But the last two trading days look suspiciously like blow-offs. Have a look at what’s happened during the last two blow-offs in sugar over the past 9 months. You can see that prior to each of the blow-offs there were frenzied gains in very short time periods, but then astute traders could have made a nice rip quickly shorting sugar for 2 to 4 weeks. Has another opportunity presented itself for one of those rips? It sure looks like it. Go elsewhere for your farm reports, international weather patterns, crop output, regional flood potential, yada, yada, yada. This is straight up tape reading. Using the futures proxy ETF of SGG, it is clear to see that $36 is an important number for sugar. Magnetic almost. Using Fibonacci from the August 2015 low to the current June high, $36 also happens to be the 38.2% retracement point on the weekly chart. 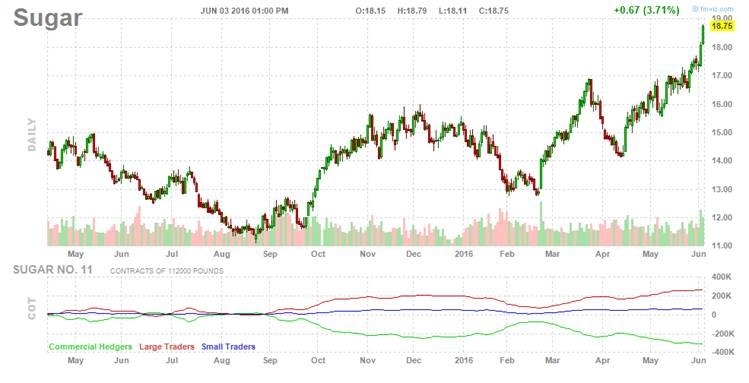 Tread lightly, if you’re inclined, as the action in sugar has been fast and furious. Just look at that whipsawing action since the start of 2015. Hedge. Trade with discipline. Manage the position. One final note from a macroeconomic standpoint, have a look at this chart of negative yield curves in Germany and Japan. If this doesn’t scream insanity to you then nothing can phase you. Maybe all the developed world’s central bankers have been secretly, partially lobotomized. A little frontal lobe here, a little hippocampus there, and you have a compliant banker with the inability to remember what negative rates actually mean and the lack of cognition to act effectively. Germany and Japan combined equal approximately two-thirds of the US economy. Which means their economies matter. A lot. 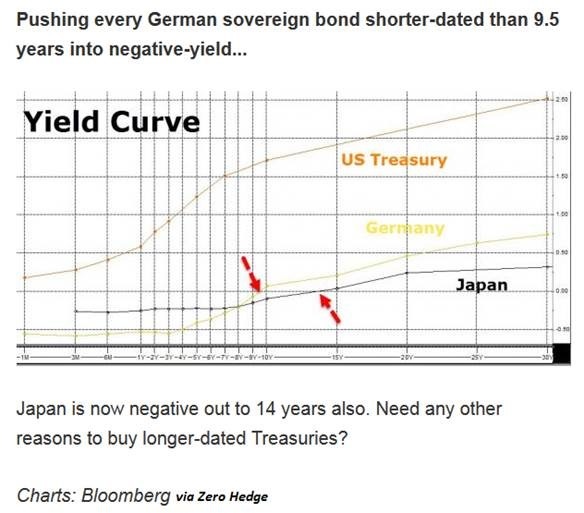 Germany has negative yields out to a decade and Japan out to 14 years, just screaming recession is near if not already present in those two countries. You think the US is in better shape economically because we don’t have negative yields? These are different and unique times, folks. The kind of times that are remembered with head shaking and derisive snorts by future students of the economic past. Trade smart. Build cash. Stay disciplined. New highs are coming, but new lows are closer than you think.